Fixing the mini greenhouse back to a wall has a number of advantages. In very windy locations, fixing back to a wall will make the greenhouse immovable even in strong gales. In addition, the wall will act like a storage heater, absorbing the warmth of the sun during the daytime and releasing that heat when the temperatures fall. 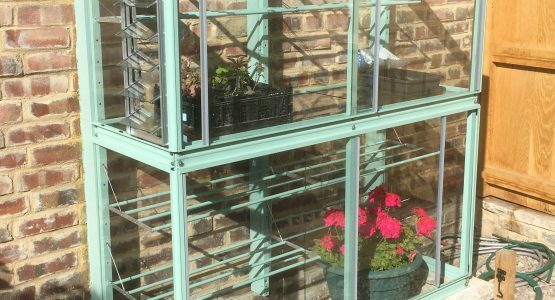 This has the effect of extending the growing day in early spring (to grow the plants need both light and warmth) and also reduces any heating costs. A lean-to greenhouse on a south facing wall will give the earliest possible crops, especially if a little bit of heat is added. The superb ventilation, and the optional auto louvre vent, ensure that the temperatures can be kept down later in the season. 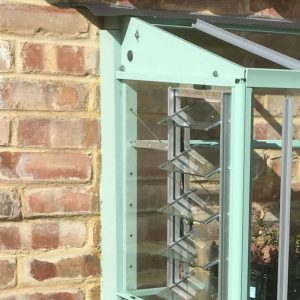 To fit the mini greenhouse to an uneven wall, simply screw a ‘goal post’ of timber to the wall, 2″ x 1″ or 2″ x 2″ timber is ideal. Use small pieces of timber to pack the vertical posts out so that they are completely vertical. Then use some outdoor silicone sealant to seal up any gaps. Also run a bead of sealant along the top horizontal rail to prevent water ingress at the top. Once the framework has been completed just use 2″ wood screws to secure the mini greenhouse to the frame. 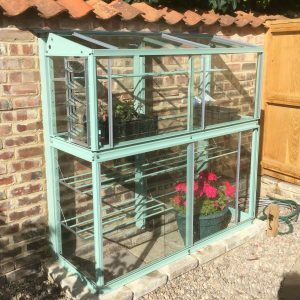 In the photograph, the mini greenhouse has been screwed to chunky vertical wooden timbers that have been painted the same colour as the greenhouse itself. A small piece of flashing has been placed over the top of the mini greenhouse to prevent water ingress. Slabs have been laid onto the ground to provide a firm and level base. The mini greenhouse is secured back to the timber back posts and also the floor.